In this article, we have solved 25 questions of Quantitative Aptitude asked in SSC CGL Tier-1 exam 2016. This exam was organized from 27thAugust to 11thSeptember, 2016. These solved questions will give a gist of the type of questions, their difficulty level, and expected time spent on each question. Explanation: The difference between 12:00 noon and 4 AM is 16 hours. if a clock gains 15 minutes in 24 hours, then it will gain= 15*16/24= 10 minutes in 16 hours. Hence, the clock will show time = 4:10 AM at 4 AM. Explanation: After first discount, the selling price of home theatre = 4950*80%= Rs. 3960. After second discount, the selling price= 3960*85%= Rs. 3366. Question4. A bookseller bought 500 text books for 20,000. He wanted to sell them at a profit so that he get 50 books free. At what profit percent should he sell them? Explanation: The price of 500 text books = Rs. 20000 (given). If bookseller wants to sell 450 books after saving 50 textbooks, then the price of 450 textbooks = 20000*450/500 = Rs. 18000. The profit to be earned = Rs. 20000 – Rs. 18000 = Rs. 2000. Hence, the profit in %= 2000*100/20000= 10%. Explanation: The salary in percentage spent on eduction of children= 100-(20 + 60 + 10) = 10%. Let the salary is Rs. x.
x*10% = 30; = > x= Rs. 300. = (6.64 *1000 m)/20 seconds= 332 m/s. Explanation: Interest rate= Rs. 75 per thousand= 7.5 per cent. Hence, the simple interest= 2000*2*7.5/100= 300. 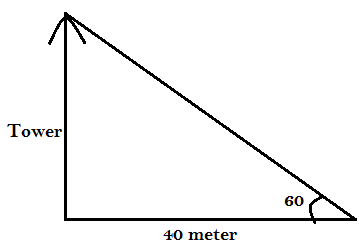 Explanation: The length of altitude in equilateral triangle= √3/2*side= 8√3 cm. Explanation: In case of circumcentre, AO=BO=CO= 8 cm. Question 12. Given that tan(θ + 15°) = √3. Then the value of θ is? Explanation: The length of room = 1517 cm. The breadth of room = 902 cm. The no. of tiles to cover the room = (1517*902)/41*41= 814. Question 14. The average of fruits offered in a temple in a week was 75. The average of fruits offered in six days excluding Tuesday was 72. How many fruits were offered on Tuesday? Hence, the total number of fruits offered in a week = 75*7= 525. Hence, the total number of fruits offered excluding Tuesday= 72*6= 432. The number of fruits offered in temple on Tuesday= 525 – 432= 93.
a3 – 3ay – x = (5/2)3-3*(5/2)*1 - 8 = 125/8 -15/2 -8 = 1/8. Putting all these values in all options, we get option (a.) to be the true answer. Question 16. If x + 1/5=5, then the value of 6x/(x2+x+1). Hence, the triangle is right-angled at point B. 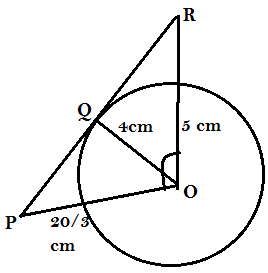 Explanation: Since, POR triangle is a right-angled triangle;therefore, PR =√(5)2+(20/3)2=25/3 cm. 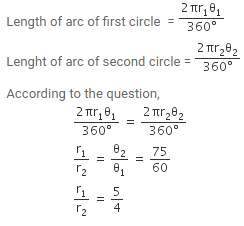 Explanation: if the radius are same for sphere and hemisphere. Which state has the maximum percentage of electrified villages? Explanation: It is obvious to the figure that villages of state D has the highest electricity. If the Central Government desires to give aid for speedy electrification starting from states with least electrification, which state will get fourth rank in order of priority? How many States have at least 60% or more electrified villages? Explanation: The average % number of electrified villages in all states= 25 +45 + 20 + 60 + 55 + 30 = 235/6. 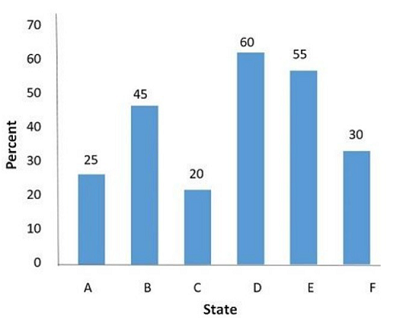 The 60% of this figure = 23.5. hence, there are five states, which have more electricity than others. Which state has twice the percentage of villages electrified in comparison to state F? Explanation: it is obvious that state D has the twice electrified villages than F.